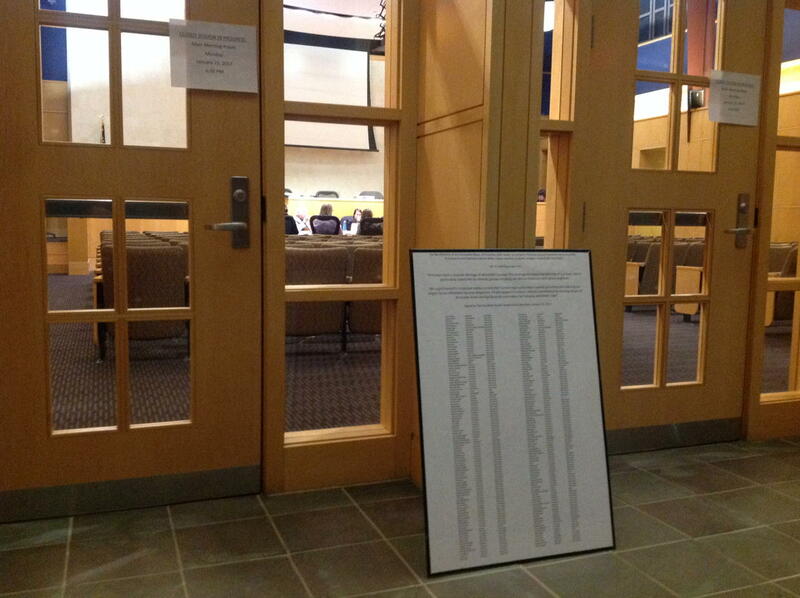 Princeton Council members expressed anger and frustration at their regular meeting Monday night after being presented with a 200-signature petition urging a compromise in their ongoing affordable housing litigation. In front of a packed town hall, several Council members publicly blamed the Cherry Hill, NJ-based housing advocacy group ‘Fair Share Housing Center‘ for the lack of progress in agreeing a figure for how much affordable housing Princeton should build. But Fair Share hit back on Twitter, accusing the Council members of presenting ‘alternative facts‘, and offering a fully-public negotiation session. Princeton’s affordable housing litigation relates to the failure of the state ‘Council on Affordable Housing‘ to develop quotas for affordable housing for each NJ town. After years of failure, the responsibility to set affordable housing numbers passed to local judges. Fair Share Housing Center has aimed to work with every New Jersey town to set a ‘fair share’ of state affordable housing needs for each municipality. Almost 100 towns have already agreed settlements, including the Mercer County communities of Robbinsville, Ewing, and Hamilton Township. But Princeton has chosen to continue the court action instead of settling, hiring lawyers who recently failed in a case before the NJ Supreme Court to eliminate affordable housing requirements from 1999-2015. At the Council meeting on Monday night, Council President Jenny Crumiller said that people have been putting pressure on Council members to agree a settlement, but that maybe they should put pressure on ‘the other side’ as well (i.e. Fair Share Housing Center). Senior Council member Bernie Miller said that people had been calling him up urging a settlement, but that it took two sides to settle, and the other side were not being ‘reasonable’. Council Member Jo Butler suggested that there was ‘misinformation’ being spread about the case, and Mayor Liz Lempert promised an ‘FAQ’ (Frequently Asked Questions) to support the Governing Body’s version of events. But Fair Share Housing Center disputed the Princeton Council members’ statements, describing the idea that they were not open to a settlement as ‘alternative facts’. They further offered to make the negotiations for a settlement fully open, so that everybody could see their position. At the time of writing, there is no indication if anybody from Princeton Council will accept this offer. The trial at Mercer Superior Court continues, with no outcome expected before February at the earliest. This entry was posted in Affordability, planning, Princeton and tagged affordability, Affordable housing, coah, planning, Princeton. Bookmark the permalink.